Longlife are the UK’s leading supplier of stainless steel exhausts. 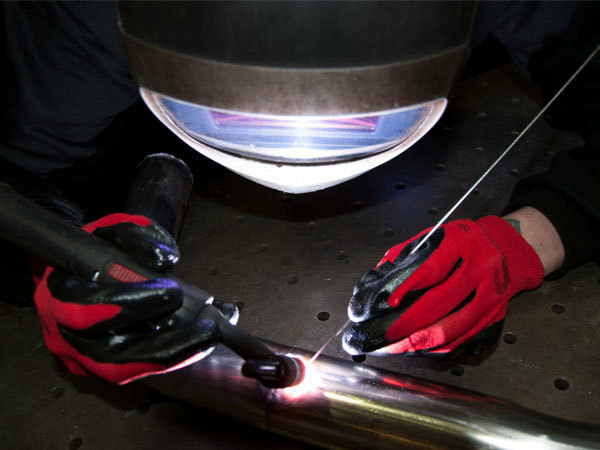 At Longlife, we have over 30 years of experience in exhaust design and manufacture. So what ever your requirements, you can be assured that we have the necessary expertise to provide a solution. Whether you have purchased a classic car, a performance car, or simply want to upgrade to a high quality exhaust system for your everyday car. A stainless steel exhaust is a stylish, performance enhancing addition to any vehicle. We manufacture all of our exhausts from 304 and 316 grade stainless steel. Once fitted should give you a lifetime’s trouble free use. Our highly trained staff will fabricate a custom-built exhaust system to complement your car, matching the solution to your requirements. Owners of foreign import vehicles can sometimes find it hard to get exhaust replacements in the UK. At Longlife our specialist teams can design and build an exhaust from scratch for your car, whatever the model. We have so much confidence in the Longlife exhaust products and installation service that we provide an industry leading lifetime warranty on all our exhaust systems for the period which you remain the registered keeper of the vehicle. This is designed to give our customers complete peace of mind. In the unlikely event that a problem arises. Simply make an appointment to take the car to your Longlife dealer who will carry out any remedial work required, free of charge. We keep our prices competitive without compromising on quality. The initial outlay on a Longlife exhaust will soon prove to be a worthwhile investment and over time should save you money in your vehicle running costs. At Longlife we aim to make our products as affordable as possible, and we are pleased to be able to offer a finance option for customers who would prefer to spread the cost of upgrading to a stainless steel exhaust. Our exhaust systems are manufactured from 304 and 316 grade stainless steel. A high grade stainless steel exhaust has a far longer lifespan than a standard exhaust. Having a stainless steel exhaust fitted is a sound investment as it can offer you cost savings over time in several ways. Standard exhausts made from aluminised steel are prone to rust, so they are likely to need to be repaired or replaced after a few years of service. The life of a factory fitted exhaust varies by vehicle, but maintenance work is usually required within a few years of purchase for most cars. Corrosion in exhausts made from aluminised steel can occur because of salt spread on roads during wintery conditions. If cars are mainly driven for short journeys there is an increased risk of rust damage to exhaust pipes. This is because the moisture formed from condensed gases within the exhaust may not have time to dry out fully when the car is in use for only short periods. Stainless steel is a very durable option because the chromium in stainless steel makes it resistant to corrosion. Longlife stainless steel exhausts have the added benefit of being manufactured to exacting standards to meet the demands of any car. Unlike a standard exhaust, our Longlife exhausts will continue to look good for years, with just a little cleaning required to prevent tarnishing. The construction of our top quality stainless steel exhaust systems help to maximise gas flow. This reduces the effort required by the engine and saves you money on fuel costs in addition to helping increase power. Longlife exhaust systems are fully customisable to meet the needs of different drivers. If you favour the enhanced sound of a performance car, we can build an exhaust accordingly. However, if minimal sound is important to you we will ensure that your exhaust system is fitted with the most suitable product from our range of silencers, so that the car runs as quietly as possible. A stainless steel exhaust can save you money on repair and running costs during your ownership of the vehicle, and it may add to the resale value of your car when you come to sell it. 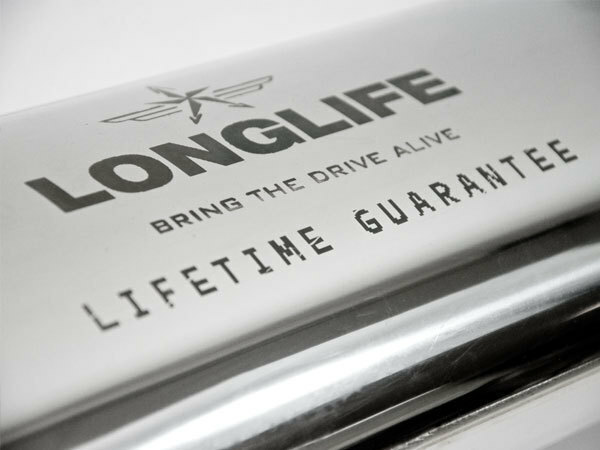 What’s more, you’ll never need to pay for a new exhaust on the vehicle again, thanks to Longlife’s unique lifetime guarantee. All Longlife silencers are made in house and this enables us to retain full control of the manufacturing process and ensures that our rigorous quality standards are adhered to. We are committed to delivering the best quality exhaust systems, so all Longlife components are made from 304 grade stainless steel, rather than inferior 409 grade stainless which some manufacturers use. Our expert team have experience of making and fitting exhaust systems on a vast range of vehicle and are always keen to take on the challenge of finding the best solutions for our customers. Our stainless steel exhausts are custom build on your vehicle, whatever make or model of car you have, a Longlife exhaust will always fit perfectly. When you visit us on your booking, your requirements will be discussed and recorded on a job card which you approve before any work begins. We will then ensure that your new stainless steel exhaust is fitted to meet the exact requirements for you and your car. On completion of the job, a 12 point check will be completed by QC member of staff to ensure that the exhaust has been built to spec and you will be provided with a detailed invoice, listing all the work carried out on your vehicle. Each Longlife custom built exhaust comes with an industry leading, lifetime guaran tee. In the unlikely event you have a problem with your exhaust, simply phone the fitting centre to make and appointment and they will book you in for rectification work. You will need to produce your original warranty paperwork when you visit the centre so be sure to store it safely.